There is no doubt that the newly elected government in Libya – both the legislative and executive branches – faces tremendous challenges over the next 18 months. Under the leadership of Dr. Mohammed Magarief, the General National Congress must establish its legitimacy to enact key legislation needed to move the country forward in the short term while managing the process of drafting a new constitution for the country. At the same time, the new executive arm of the government, under the new Prime Minister, must ensure that the government is able to provide an expanding set of services while setting a foundation for the country’s future prosperity. At this stage, efforts at re-establishing security are a priority. Otherwise, the instability witnessed since the revolution’s success in toppling the Qaddafi regime will continue to undermine efforts to attract investment, both foreign and domestic, and to rebuild the economy. While serving a heroic role during the revolution, the country’s various militias are increasingly playing a destructive role by undermining the authority of the government, decreasing public security and engaging in criminal activities. The government’s recent ultimatum to “illegitimate” militias moves in the right direction, but inevitably the Libyan military will be called upon to deliver on this ultimatum with a show of force. While the right to bear arms and participate in (regulated) militias can play a positive role in the future of Libya, the State must be able to ultimately hold a monopoly on the use of force in order to protect the population from violence and to demonstrate the stability needed to facilitate economic growth. Effective disarmament will depend on concurrent efforts to provide militia members with viable employment options (see below) and efforts to redress standing grievances between groups in conflict. In this regard, establishing a national reconciliation project must be a priority in the near term. A structured dialogue must be put in place to allow various groups within Libya to voice grievances, whether at the national and regional levels or related to more locally confined conflicts. Existing tensions must be aired in a transparent process based on justice, with all parties seeing a potential role for themselves in the political and economic future of the country. Movement on these two socio-political issues provides the platform from which successful economic reforms can be made. At the same time, however, they will not be successful unless the Libyan population sees progress toward economic stability, equitable economic growth and job creation. As such, the two processes of political development and economic development are co-dependent, demanding that the new government move rapidly on developing and deploying a coordinated strategy for Libya in both regards. 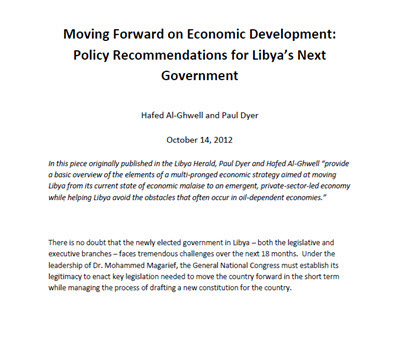 This note is intended to provide a basic overview of the elements of a multi-pronged economic strategy aimed at moving Libya from its current state of economic malaise to an emergent, private-sector-led economy while helping Libya avoid the obstacles that often occur in oil-dependent economies. The proposal is not one that is easily implementable, as it requires access to considerable technical expertise and, more importantly, because it carries considerable political risk for Libya’s new leadership. It will also come at significant short-term cost to the country’s belabored coffers. However, with the commitment of Libya’s interim leadership and support from the international community, the reforms proposed below will put Libya on a long-term track befitting the aspirations of the Libyan people and the goals of the revolution. Facilitating the establishment and growth of the private sector should be at the top of the policy agenda. Development of viable small- and medium-sized enterprises is particularly important, given that most employment creation happens in this sector. To date, private sector investment has been limited given the uncertainty over security and future government policy. Also, given the legacy of Qaddafi’s repression of the private sector, there is little in the way of an effective private sector in Libya. On the other hand, there is dramatic potential for success in the private sector. Given years of mismanagement and weak investment by government overall, there are ample opportunities for entrepreneurs to start and grow successful businesses, no matter the sector or activity in which they decide to engage. Moreover, there is a large population of Libyans outside of the country seeking a means of returning and playing a constructive role in the rebuilding of their country. At a fundamental level, building on this potential will require the Libyan government to establish a new legal framework for private sector firms that gives them a clear understanding of the regulatory context in which they will be building their new enterprises and that gives them the flexibility they need to establish successful start-up businesses. This requires a delicate balance between ensuring that necessary regulations (and enforcement) are clear, transparent and set up to protect the interests of the population at large, while eliminating major rigidities that limit private enterprise. One area of the regulatory context that is particularly important, given Libya’s need for job creation, is that related to labor. In the past, the Qaddafi regime maintained rigid control over private sector hiring, firing and wage decisions, going so far as to set wages for each industry and position (although such mandates were poorly enforced). In order to stimulate job creation in the private sector, the new Libyan labor law must give employers control over determining wages and the ability to dismiss workers on the basis of poor performance or economic necessity. This flexibility will enable start-up firms to take the risks of hiring new, untested employees by reducing concerns about the inability to dismiss them in the future (or the costs of doing so) should the business face a downturn in the business cycle. It will also ensure that workers have the right incentives towards worker productivity. This means pass a labor law that allows for temporary, renewable employment contracts rather than permanent contracts. Also, the government should refrain from mandating severance packages and minimum wages, as well as limiting any mandated payments by employers into social safety nets. While such regulations provide important protections for workers, they often do so at the expense of employment, raising the costs to firms of creating jobs. At the same time, workers will need access to a new social safety net that provides needed protections (see section on social safety net below). Moreover, the law should provide for the creation of independent labor organizations able to lobby for worker interests. Other regulations should focus on easing the costs and time required for new business start-up. In this regard, the government should seek to reduce time required to register a business, possibly setting up a “one-stop shop” that allows entrepreneurs to complete all documentation in one step. While there is an argument for minimum capital requirements – which are designed to ensure that new businesses have enough capital to start ventures without failing in the first year – they are usually ineffective (as businesses find ways around them such as getting short-term personal loans from banks) and thus only serve as another administrative obstacle to start-up. Rather, the government should allow businesses to start without any minimum capital requirements, but focus on streamlining the closure of failing businesses. As such, a modern bankruptcy law – which allows for the efficient closure of businesses while decriminalizing bankruptcy – is essential. Another area of strategic importance is the banking and financial sector. An emergent private sector will need access to finance from a more dynamic financial system. This comes in part by gradually opening the banking sector to private investment. At the same time, there is an important role for government in regulating the banking sector, particularly in regard to ensuring that banks are following proper accounting procedures and have adequate reserves to cover deposits. There is also a role for government – particularly in the early phase of Libya’s transition – in supporting the emergent private sector with seed funding (either through grants or low interest loans), loan insurance and access to advisory services and business development services. Programs in each of these areas will help new entrepreneurs to successfully transition from small start-ups and begin building their businesses. Government can also play an important role in stimulating private sector development by enlisting private participation in realms traditionally thought of as government responsibility, including infrastructure development and service delivery. Rather than investing in the capacity to repair roads, build clinics and enhance the telecommunications infrastructure, Libya’s government should seek to identify ways to involve the private sector, either by opening these sectors up to private participation, by contracting government services provision out to the private sector, or developing public-private partnerships to meet public demands. Government can also target sectors or types of business (ex: youth-owned small businesses, businesses that employ Libyans) by identifying preferences or requirements for securing particular procurement contracts. Privatization of state resources provides another means by which to trigger private sector development. This includes gradually privatizing state-owned enterprises and selling on state assets such as land. Any privatization program must be done carefully to avoid perceived favoritism and the capture of such assets by concentrated groups of moneyed interests. Towards this end, government officials may consider offering ownership of state-owned enterprises to workers’ collectives. While privatization is important to increasing efficiency and boosting productivity, the public’s interest should be kept sacrosanct. Around 65% of the Libyan labor force depends on government or public sector positions, and the International Monetary Fund as almost 19 percent of GDP estimates the government wage bill alone. From a financial perspective alone, this is not sustainable. As Libya moves forward, it is essential that government take steps to increase efficiency in the public sector and to decrease the numbers working in government. Importantly, high public-sector wages and prospects for more government jobs will decrease incentives for workers to pursue employment or entrepreneurship in the private sector. The attractiveness of public employment – in terms of wages, non-wage benefits and job security – not only leads youth to queue for public positions but shapes the investments they make in education, ensuring that they follow educational pathways that align with the needs of the public sector rather than preparing them for positions in the private sector. As such, it is a core priority to reduce the size of the Libyan civil service, to reduce public sector wages and to otherwise reduce the attractiveness of work in the public sector. Given the scale of public sector employment in Libya and the dependence of so many Libyan families on income from these positions, this advice is not put forward lightly. Public sector rationalization will require careful study of the costs to potential winners and losers in the reform and the development of mechanisms designed to ensure that downsized workers dependent on public sector income are protected as much as possible. To this end, there is a diverse menu of policy options open to the Libyan leadership. On one level, they include natural attrition (allowing older workers to retire) and hiring freezes. More actively, rationalization can be secured through accelerated attrition through substantial wage adjustments or benefit cuts, or explicit retrenchment through layoffs matched with a mix of financial incentives. Each method may be introduced separately, sequentially, or simultaneously. Under the Qaddafi regime, the government heavily subsidized electricity, fuel and basic food items. Meeting the costs of these subsidies will account for nearly 16 percent of GDP in 2012, according to the IMF. While such subsidies provide an important resource for many Libyan families, they do the economy a fundamental disservice. First, they introduce market inefficiencies that often lead to black market profiteering on the part of distributors. Secondly, they crowd out opportunities needed to help build Libya’s private sector. Moreover, because the subsidies are not targeted – but are available to the whole population – they lead to waste, subsidizing the rich, and lowering the benefits to the poor and disadvantaged who need them most. Ideally, the Libyan government would move to abandon subsidies in favor of targeted cash payments to low-income households on the basis of identified needs. If there is no ability to legitimately identify households based on income, the government might at least target households by making households enroll in the transfer program in need using geographical information or by linking transfers to participation in work programs or particular education programs that are designed to assist those in need. Naturally, oil resources will continue to provide the government with the bulk of its revenues and will serve as a fundamental component of the country’s overall GDP. The challenge to Libyan policy makers is determining how the benefits of the country’s oil wealth is redistributed to the population in a sustainable way that limits the skewing affects that oil has had in the past (and has on most oil-dependent economies). In the past, redistribution has largely been carried out through public sector employment and subsidies. As noted above, these efforts have had long-term negative impacts on private sector development and employment outcomes, and have created a dependency culture among Libyan citizens. As the Libyan oil industry returns to full capacity, policy makers should rethink how to structure the means by which the Libyan population benefits from oil revenues. Rather than focusing on income directly, policy makers should consider shifting expenditures of oil revenues towards enablers of future income. This is particularly important in regard to education. As it stands, the education system in Libya does not provide youth with the basis of skills they need to enter the labor market and to be competitive in an emerging private sector economy. As such, oil revenues provide the basis for significant investment in improving the opportunities and quality of education provided to Libyans, whether through the public school system or through scholarships and student loan programs designed to enable youth to secure quality higher education. Similarly, by investing in a comprehensive health insurance scheme, the government can enable private investment in the health sector while ensuring coverage for the population as a whole. On the whole, oil revenues are best spent on making sure that Libyans are healthy enough to work and better prepared with the skills they need as workers than in providing them jobs and subsidies. Libya’s oil wealth is also a diminishing resource. In order to ensure that the benefits of oil continue for future generations, Libya should bolster the existing strategic fund run by the Libyan Investment Authority along the lines of the Kuwait Fund for Future Generations or the Alaska Permanent Fund. In each of these cases, law requires that a set share of revenues (10-25%) each year is invested in a mix of foreign and domestic assets. Herein, the Alaskan model provides an interesting component that allows for citizens to benefit directly from oil revenues without dependence on public sector work or subsidies. Each year, a dividend based on the Fund portfolio’s performance is sent to each household in Alaska. While the amount differs every year, it is generally about US$1000. Establishing such a dividend payment in Libya would ensure that every Libyan – despite need – feels that he/she benefits from the oil industry. Moreover, it gives each household an additional amount of income that they can add to household consumption, invest in their businesses or apply to other needs. Since the beginning of the Libyan revolution, local municipalities have done a surprisingly effective job of ensuring public service delivery. By ensuring that decision-making authority and responsibility are effectively closer to citizens than they had been under the Qaddafi regime, the central government will be able to increase the legitimacy of the governance framework, increase accountability, and focused its energy and efforts on its most important roles, as a policy making and supervisory instrument, by delegating decision-making authority and service delivery down to the lower levels and across the country. Decentralization will also help to alleviate concerns held by regions outside of Tripoli regarding the future of their regions and cities, and will ensure that their voices will be heard and included in the delivery of services that they depend on for their daily life. It will also allow for Intergovernmental transfers that shift general revenues from taxes collected by the central government to local governments for general or specific uses; and will enable local administrations to supplement federal funding through taxation, and fee collections. Naturally, there are certain areas in which the central government will want to (and should) maintain control over. These include oil production, national defense and, in cooperation with local authorities, internal security, and foreign affairs. Moreover, the central government can play an important role in determining development priorities and ensuring equitable distribution of resources across regions in how it regulates and distributes assets for public spending. However, given that local governments are closer to citizens and thus better able to identify particular needs of any given population, a decentralized approach to most public services should prove optimal. Much of this note has focused on the destruction or revision of programs and policies established under the Qaddafi regime. While such reform will prove beneficial in the long run to the economy and citizenry of the country, it will test the political will of Libya’s new leaders. It is important in this context that policy makers be seen as investing heavily to create new programs and opportunities for the Libyan people, particularly those that help the country’s large youth population in bridging the transition from school to work. The challenge is to focus these programs on areas of core demonstrated need and to ensure that they effectively address core economic challenges without distorting future outcomes in the economy. In this regard, the government should avoid where possible efforts to invest in active labor market programs such as public sector work programs. While such programs do have the merit of providing immediate work to the unemployed, they do little to prepare young people for future opportunities in the labor force. Often times, participation in such programs can actually undermine one’s chances of securing future work as it is seen by potential employers as a signal of poor potential as a worker. Rather, Libyan authorities should look to invest in programs that help prepare youth for job search and initial jobs. These include programs focusing on career counseling and job search skills, soft skills training (leadership, communications, customer service, language training and computer skills training), job matching services and business skills training. By decreasing public sector employment and easing regulations on private sector employment, the Libyan government will alleviate some of the skewed incentives that have led to high unemployment rates and will help new businesses grow. At the same time, it is important to highlight the role that both public employment and the strict regulation of private sector employment have played in providing workers with social protections. Efforts to reduce the public sector and to introduce more flexibility in the hiring and firing decisions of private sector firms will expose Libyan workers to more risk. In turn, it is essential to put in place a new social safety net. This should have several components that, if implemented carefully, can provide workers and their families with needed protections while allowing the government to encourage more private sector employment. In developing this social safety net, policy makers should consider the development of an unemployment insurance scheme, wherein workers and employees would pay regular (but affordable) contributions towards insurance that provides partial salary replacement should the worker be unemployed in the future. Given the differential between pension availability in the public sector and the private sector, and the need to move more workers to the private sector, there is also a need for the establishment of a pension system that provides for retirement income for Libyan citizens no matter where they are employed. As discussed briefly in the section on subsidies above, there is also a need for social safety net programs designed to meet the basic needs of poorer families in regard to basic food needs and other costs. 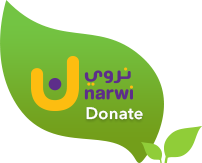 These can include cash transfers, in-kind transfers, supplementary food programs, and fee waivers (for such services as health care, education and utilities). Such benefits should be targeted as closely as possible to economic need, rather than being made to the population in general. As Libya moves forward in developing its economy, it faces a challenge that has bedeviled the countries of the Gulf Cooperation Council since the 1960s and is one with which Libyan policy makers are all too familiar. Given the marked skills gap between Libyan workers and the developmental needs of the country, there will be continuing pressure to pull in foreign workers to fill more technical positions, as there will be demand for low-skilled workers to serve as laborers. Some importation of workers will certainly be necessary. However, policy makers should understand that the way in which they allow foreign workers into the country and to participate in the labor force has an impact on their own efforts to increase employment among Libyan workers. Gulf states have generally allowed for immigration based on firm demand: firms pay minimal fees for worker visas and, in turn, serve as sponsors for foreign workers. Workers are not able to switch employers without securing a letter of no-objection from their employers. Coupled with the relatively low wages expected by foreign workers, this system has promoted the employment of non-nationals at the expense of high unemployment among nationals. In turn, these states have struggled for years with ineffective efforts to enforce hiring quotas, while firms continue to favor the hiring of foreign nationals. Given the challenges Libya already faces in regard to youth employment, government officials should consider restricting immigration or at least imposing constraints on immigration that incentivize firms to hire Libyan nationals rather than non-nationals where skills exist or where they can be improved through training. At the simplest level, this includes imposing significant fees on worker visas and ensuring that once foreign workers are in the country, they have the ability to switch employers. Foreign workers should also have to pay into (and thus benefit from) unemployment insurance and other social safety nets. With such regulations in place, firms will be more willing to consider hiring Libyans (and training them) rather than focusing on the hiring of foreign workers. A similar issue relates to the role of foreign investors and foreign-owned businesses in Libya. Opening the Libyan marketplace to foreign competition by allowing firms owned by non-nationals to do business in the country will ensure that needed investment begins entering the country quickly. At the same time, this will push national firms to be more competitive. However, given the lack of private sector development within Libya to date, there are concerns that such foreign participation will overwhelm the nascent domestic private sector. Given internal pressures, it is much more likely that the Libyan government will favor a more controlled role for foreign interests, mandating national ownership requirements for firms active in the domestic market (51% domestic ownership), with foreign entities operating through agency agreements with local firms. This will protect the short-term interests of the domestic private sector, but it comes at a long-term cost: with such protections, the domestic private sector will favor rent-seeking activities based on agency agreements rather than investing in truly entrepreneurial activity that would lead to the diversification and development of the Libyan economy. The above described issues are but a brief overview of the policy decisions that the new Libyan government is tasked with in defining the economic future of the country. As such, they reflect elements of a comprehensive strategy for reform, as well as difficult decisions that need to be made on the part of the country’s new leaders. The ability to move forward on all or even some of these issues will depend on the government’s ability to effectively communicate the need for these reforms and to sell them to the Libyan population. Moreover, given that many of the elements described above were initiated in the context of reforms under the Qaddafi regime, movement in this direction may face strict opposition from the country’s population. Still, steps towards opening Libya’s economy are important to the country’s long-term growth, efforts to reinforce the revolution’s democratic aspirations and the revision of the role of government from provider to economic enabler. Moving forward on this transition is possible, however, with a government commitment to clear and transparent communication with the population, a predictability and consistency to reforms, and decisions based on careful study using reliable data. Hafed Al-Ghwell is an Advisor to the Executive Director and Dean of the Board at the World Bank Group. Paul Dyer is a Senior Research and Policy Fellow at Silatech.